Found 2 file extension associations related to DAZ 3D Carrara Pro and 1 file format developed specifically for use with DAZ 3D Carrara Pro. Carrara is a complete 3D authoring suite that provides advanced tools to help you get your work done faster and better than your competition. Whether you prefer to work with people and places, skies and clouds, oceans and landscapes, lights and shaders, particles and physics, polygons or splines, Carrara will open up grand new vistas as you bring your imagination to life. Recognized by professional 3D artists as a robust and versatile 3D toolset, Carrara lets you do it all. With improved import and export options, Carrara fits well into most any pipeline and can do just about anything. 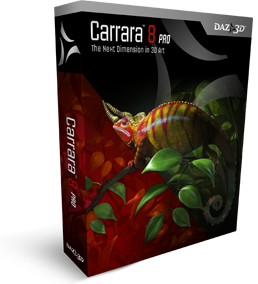 Probably the best-kept secret in complete 3D modeling, animation, and rendering suites, Carrara can be yours for a fraction of what the mainstream applications charge. If you need more information please contact the developers of DAZ 3D Carrara Pro (DAZ 3D Inc.), or check out their product website.